With the approaching of the New Year comes a tremendous amount of anticipation regarding the technological changes we are likely to see in the coming months. Numerous innovations have already shaken up the real estate industry over the last month, including new platforms, virtual reality, and the ability to do far more in the field than was ever thought possible. Even so, tech startup companies could face a number of new challenges in 2016 as they work to meet the rapidly changing needs of the real estate industry. 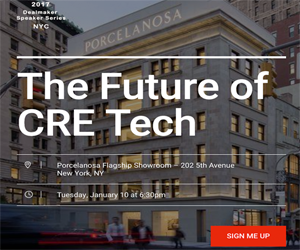 A number of new tech trends are shaping up to change the face of the real estate industry, and tech startups will need to work quickly to leverage those trends and deliver solutions that will keep the industry moving forward. Among the most significant of those trends is big data. Around the country, commercial real estate is booming and investors are actively seeking the most profitable locales in which to invest. Big data provides improved decision-making capabilities for brokers as well as their clients; however, cutting-edge solutions are necessary to give real estate investors the analytics and business intelligence they need to make decisions in real time. In the past, brokers were forced to rely on copious numbers of spreadsheets to analyze data. Today, the most sophisticated brokers and their clients are utilizing big data and analytics to improve portfolio performance. The reality is that it is simply no longer sufficient to have available comps. With the vast amounts of data now available for mining, the stage is set for a great divide to occur in the real estate industry between those who are successful and those who are not. Tech startup companies will need to recognize exactly how much is riding on the line and provide the solutions brokers and their clients need in order to move to the next level. 3D technology could also prove to be a sticking point in the real estate industry. International investors with an appetite for global investment will no longer need to travel to visit prospective investment sites, as 3D technology will provide the opportunity for one-on-one personal tours. In order to leverage this capability and potential, however, tech companies will need to move far beyond simply providing virtual tours and focus on the ability to provide fully immersive experiences. From offering a point of view from a specific unit to running tests that allow prospective clients the ability to optimize traffic flow and workflow, interactive 3D technology will soon become a must for efficient marketing. Finally, tech startup companies will need to ensure that they are providing real estate clients with complete end-to-end solutions. Such solutions have the potential to be game changers in the real estate industry, particularly in the commercial sector. If developed properly, such solutions allow for improved deal automation, customer relationship management, and financial analysis all in one system.